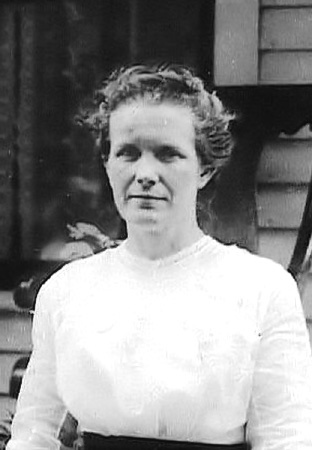 Alice Paulina Leary was born in Putnam, Co., Ohio on Feb 18th, 1873 near Vaughnsville on a farm. Her birth certificate lists the location as Sugar Creek Township. Her birth certificate was recorded on May 19, 1873 in Putnam County, Ohio. The first work Alice could remember doing as a child was working in an onion field. When 13 years old her family moved 12 miles north near a small town called Miller City, Palmer Township, Putnam County, Ohio. Here at this location Miss Alice Leary was converted and united with the Christian Church at the Forest Grove Church on the Ottawa Pike Rd at age of 15. Using current road names, Forest Grove Church would be on 15 just under 2 miles west of 108. This location is still in Miller City which is 3-4 miles to the northeast. In 1889 she met Harvey J. Miller who at that time was teaching her Home School. On August 8 in 1891 J.H. Miller and Alice Paulina Leary were united in marriage. They lived on a farm in Liberty Township, west of Leipsic, Ohio for about 12 years. From there they moved with their two children Clarence and Ethel to Michigan. First, in 1903, to a farm in Lamotte Township, Sanilac County, where they lived for about 7 years. From there they left farming and moved to Flint, Michigan where Alice Pauline Leary united with the Central Christian Church, Flint, in 1911. Alice had two brothers, Charles and James, who moved to Flint about the same time that she and her family moved to the Sanilac County farm. The Leary family would have reunions in Flint. They would rent a park that had an open building with a large roof where family members from Michigan and Ohio (and possibly elsewhere) would gather. The last reunion was held around 1925. From a letter written to Mrs. J. H. Miller on May 10, 1950 by Reuel Haskell Jr. 1950 was the year Alice died. . . .You paint a dreary picture of your future, and I sincerely hope and pray that your condition is not as bad as it sounds. . . . I can't imagine you weighing only 94 pounds - as I remember you (at least 50 years ago), you were on the 'plumpish' build - with blue eyes and an ever ready smile. . .
After her husband John died, Alice moved to Armada, Michigan to live with her daughter Ethel. Alice became ill with cancer. When her condition deteriorated to the point that she could not be cared for in a home environment, she moved into a hospice where she died after a long and difficult battle with the illness. 1. Residence, 1945, Fenton, Michigan. 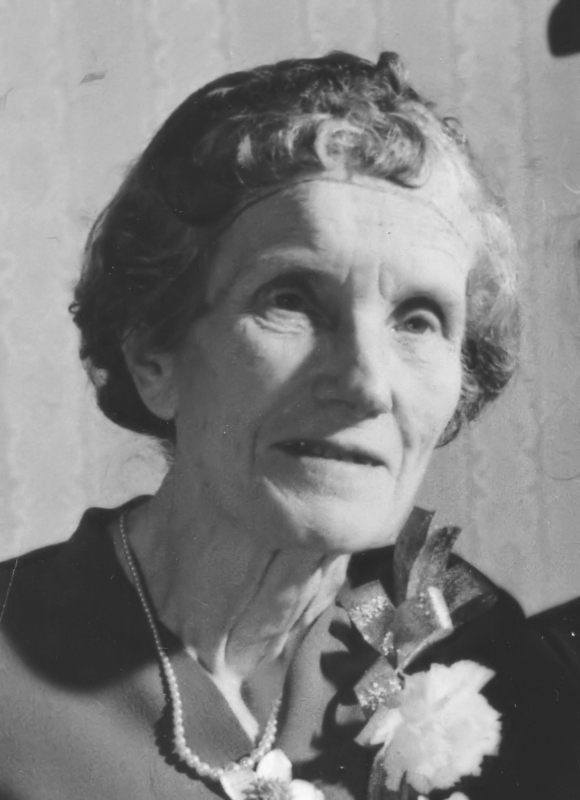 Alice Paulina Leary lived in Fenton, Michigan at the time of her sister's death. This is according to her sister's obituary. Her sister was Annabelle Leary. 2. Residence, 1880, Sugar Creek Township, Putnam County, Ohio. 65 Alice's parents, David and Lucinda, had 40 acres southwest of the intersection of Township Road S and Road 14S. 3. Residence: 12041 Torrey Road, Fenton, Michigan, 1948. Taken from address and postmark on mail. 4. Residence: 1205 North Road, 1950, Armada, Michigan. Taken from address on mail sent to Mrs. J. H. Miller by Reuel Haskell Jr.
5. Residence, 1886-1891, Miller City, Putnam County, Ohio. Alice Paulina Leary moved to Miller City when she was 13 and lived there when she married John Harvey Miller. The house was small and single story with clapboard siding. 6. Picture. This is a picture of Alice Paulina Leary taken in 1949 at the farm of her daughter, Ethel May Miller in Armada, Michigan. Alice was living there at the time. Eldon Coller brought a photographer to the farm to take a series of pictures. Pictures were of Alice, Alice with Ollie Shoemaker and Alice with Mark Coller. 7. 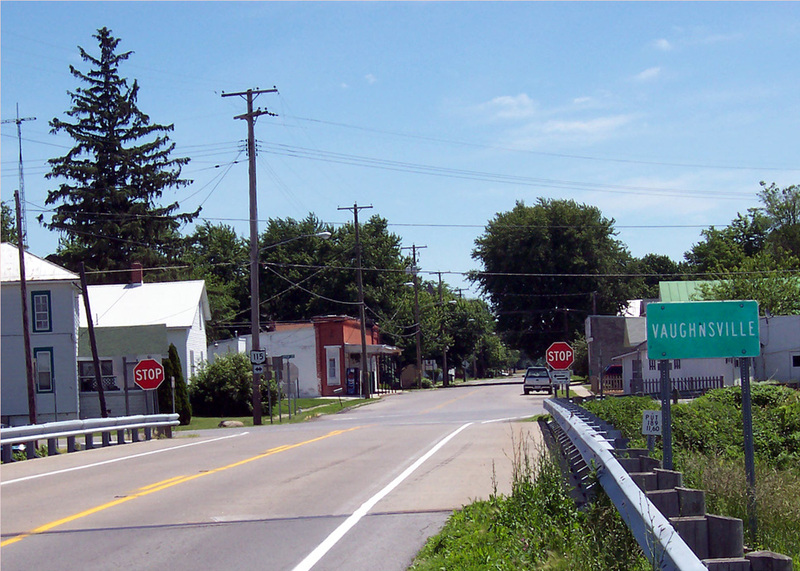 Picture, 2004, Vaughnsville, Putnam County, Ohio. This is the town Alice Paulina Leary was born in on February 18, 1873. John Harvey Miller and his wife, Paulina Leary, were married on August 8, 1891 in Leipsic, Ohio by Elder Hayes (possibly spelled Hays). Their marriage license was granted on August 5, 1891. The marriage certificate was filed on August 30, 1891 in Putnam County, Ohio.